On Friday night, Team Honda HRC’s Ken Roczen and Cole Seely were joined by GEICO Honda’s Jeremy Martin, Christian Craig, and Chase Sexton at Huntington Beach Honda for the first dealer appearance of the season, where they spent time signing autographs and hanging out with fans. For the third consecutive year, American Honda welcomed fans in the Supercross Pit Party with a huge setup that included a children’s learn-to-ride center. Certified instructors were on hand to assist and give pointers to kids as they took to the small, oval course. During daytime qualifying, Roczen impressed everyone in the second session, laying down a 52.409” lap to score the fastest time of the day, while teammate Seely was sixth-quickest with a 53.182”. 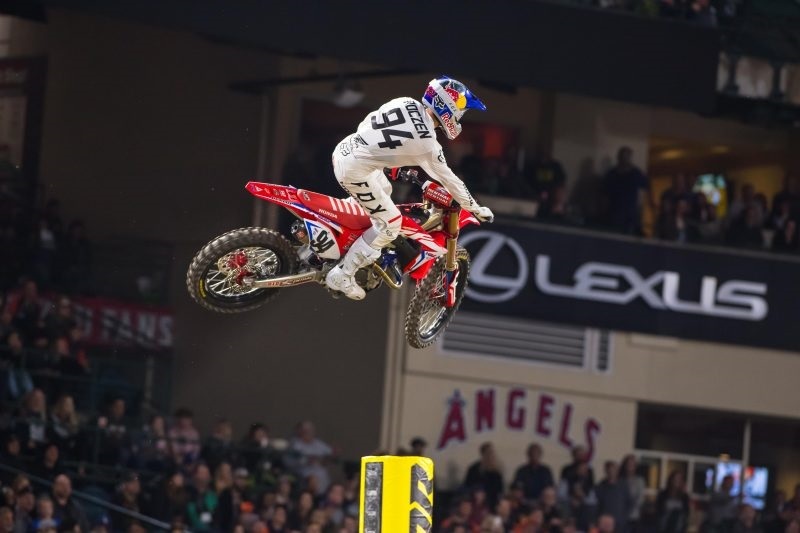 MotoConcept Honda’s Justin Brayton secured seventh and GEICO Honda’s Jeremy Martin landed 10th.